This set of jams and jellies includes unique varieties like Raspberry Smoked Maple and Carrot Cake. 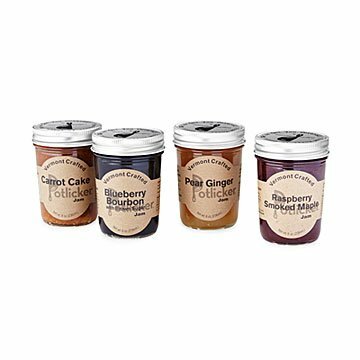 Transform your morning toast and add an uncommon dimension to recipes with this artisanal jelly & jam set. When Walter and Nancy Warner moved to Vermont they were inspired by the bountiful local food and beer culture, started hand-making small batch preserves featuring local ingredients. In this collection, each jam or marmalade is a complex ensemble unto itself—from the sweet, smoky delight of Raspberry Smoked Maple to the dessert-inspired decadence of Carrot Cake. The set also includes Blueberry Bourbon and Pear Ginger. Add a distinctive touch to cheese platters, mix them into salad dressings and cocktails, use them for irresistible baking, or indulge in a sophisticated pb&j! Handmade in Waterbury Center, VT.
Blueberry Bourbon: wild Maine blueberries, cane sugar, brown sugar, citrus pectin, bourbon, and lemon juice. Carrot Cake: carrots, pineapple, pears, cane sugar, brown sugar, coconut, raisins, pectin, lemon juice, vanilla, cinnamon, salt, and nutmeg. Pear Ginger: pears, cane sugar, citrus pectin, fresh ginger, lemon juice, and ginger juice. Raspberry Smoked Maple: raspberries, cane sugar, smoked maple syrup, and citrus pectin. The jam is so good, all the flavors are delicious. I am so excited that I found this set. I purchased a set of 4 this summer in Vermont at a festival and it was amazing! So happy to have stumbled onto it again. What a treat. Gift for my father on Father's Day. He first tried it straight out of the jar! Then he put some on his toast. He was a little weary of the different flavors, but after trying, didn't want to share; so I take that as a good sign! I'd recommend! I got one set for me and one set to break up and give as hostess gifts! Fun flavors! I'm giving this as a gift so I cannot attest to how these taste. I will say that after reading a review of how one of the jams did not appear to have "set", I did look at all the containers to ensure they were still firm. They are packaged nicely, no damaged labels. I can't wait to give them as a gift. I would definitely purchase again as they are a very unique item, perfect for someone who sends to have everything. My mother-in-law told me it was really attractively and well packaged and a very tasty product. She said it more than once, so I think she really meant it. I found it to be reasonably priced for a nice gift. These were excellent in flavor and variety. My friends enjoyed very much, as well as our family.